The Starlight, Sky Lounge and Bar, at Sheraton Grande Walkerhill introduces a Romantic Riverview Dinner through Dec. 31, 2005. 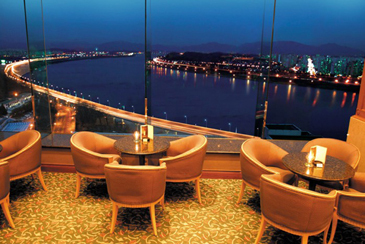 The Starlight Bar, located on the 17th floor, is well known for its breathtaking views of Mt. Acha and its dramatic nightscapes of Seoul. The Romantic Riverview Dinner is a seven course event with a selection of entrees which include Grilled Beef Tenderloin, Rosemary Coated Rack of Lamb, and Mero Fish with Nelson Scallops. Also, a special message card decorated with flowers is provided to each couple, conveying your personalized romantic thoughts. For customers holding reservations, a window seat with a great view will be provided. 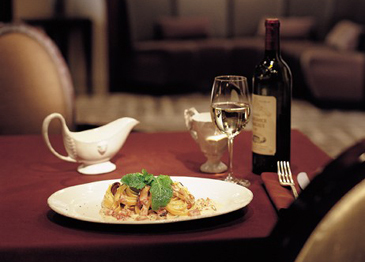 We invite you to enjoy this romantic dinner and make your own unforgettable memories at Sheraton Grande Walkerhill. Del Vino, the Italian Restaurant of Sheraton Grande Walkerhill, introduces a special wine connoisseur's dinner featuring Pio Cesare Italian Wines, on Nov. 11, 2005. Pio Cesare, founded in 1881, is a family winery that is renowned for its modern reinterpretation of Italy's traditional wines. The most attractive part of this dinner is that guests can enjoy five different kinds of wines as they savor a full, six-course Italian dinner. Included, with our compliments, is a Sommelier's explanation of each wine to make your experience even more enjoyable. The View, Sheraton Grande Walkerhill's all day dinning restaurant, introduces an "Italian Sweet Temptations" Promotion during November. You can enjoy a sumptuous Italian pastry buffet featuring Cakes created by Italian Chef Mr. Michele Carangelo and Mr. Gianni Sorrentino. Coffee and tea are provided, with compliments.